Wow, that picture of the earwig really grosses me out. I had a hard time looking at my blog all day because I knew if I did, I would have to encounter that horrible bug and it would give me nightmares! I am so glad to hear that I am not the only one they creep out. I am going to a baby shower this weekend for a friend of mine (did you know that nearly everyone I know who is married either just had a baby or is having one shortly?) and have been trying to figure out what to give her for her baby shower gift. I decided to try a little bit of home grown lovin. it will be easier to afford since I have the perfect material for it, and I really need to learn to sew. This is what it is supposed to look like. I will be sewing for most of the day today so when (and if) I finish I will show you the final product and you can all send me requests to make more for your baby showers (or beg me to bury it deep in the earth and never mention my sewing escapades to anyone ever again). At any rate, I am super excited to try this new fangled thing called a sewing machine, and see what it can do! If I like it, I may just beg my hubby relentlessly until we save up enough to go out and buy one for me to keep in the home. Regardless of what happens, wish me luck, and I will be praying no fingers get sewn into the owl. Off to explore new talents! Let me know how the sewing goes. I try to avoid anything that has to do with sewing. But, it sure is a cute look!! The owl is so cute and looks like it should be a fun project... 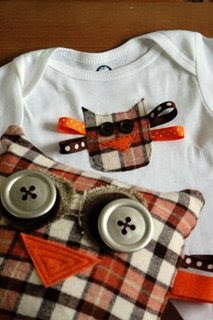 I don't know if its the nesting stage but all I want to do is craft and sew... But my back just can't handle as much I want to sew. I bet you will do great! Sometimes we do our best when we are trying so hard because we think we might not be able to do it. It looks way cute to me! I love the colors! And I must say, it seems like everyone I know is pregnant too! Its the next baby boom, I swear!